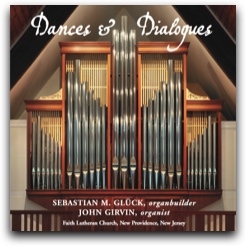 THIS recording showcases the versatility of Glück Opus 13 at Faith Lutheran Church in New Providence, New Jersey. The varied selections on this disc are performed by John Girvin, Minister of Music. 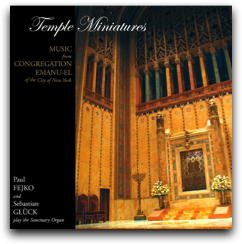 THE ORGAN heard on this recording is the larger of our two instruments designed and built for First Presbyterian Church. 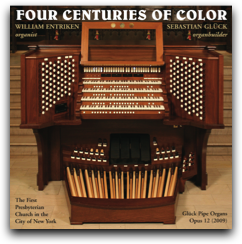 Its conception draws upon the organ music, organbuilding treatises, and surviving instruments of many eras and cultures. THIS DISC showcases the sounds of Glück Opus 7 in a suite of improvisations by Paul Fejko and a stop-by-stop demonstration by Sebastian Glück. 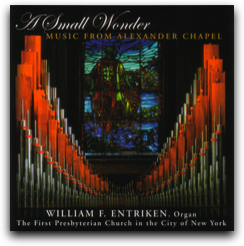 ENJOY THE PREMIÈRE recording of a Glück organ through the artistry of William F. Entriken, Organist and Director of Music at New York’s historic First Presbyterian Church. This beautifully recorded compact disc features an energetic and varied program of classic works chosen to demonstrate the stylistic versatility of this instrument.